This ambo is made in the classic half octagon shape out of mahogany with Costa Esmeralda columns. This modified traditional ambo is made of solid mahogany. The footprint of this ambo is in the shape of a modified Greek cross and is made of maple, cherry and Costa Esmeralda granite. This is the first ambo Deacon Tom made, for Christ the King Catholic Church in Cedar City, Utah. Made of solid cherry, it has a dual cross motif that carried into the other liturgical furnishings. This sweeping arch ambo and matching ambo are made of quilted cherry with birdseye maple. This traditional ambo was made for the 125 year-old church in Ogden, Utah out of quarter sawn white oak and white Carrara marble from Italy. It was antiqued to match the original high altar and altar rail. 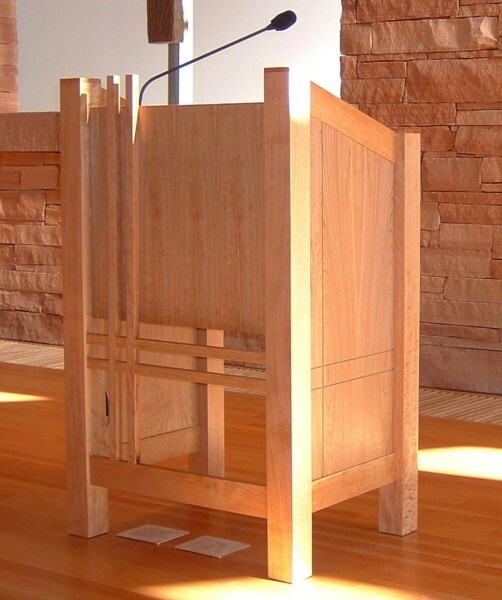 This contemporary ambo has a book rest that mimics the shape and materials of the altar. Birdseye maple with walnut base. The sweeping arch of the front of this ambo draw the eyes upward to the Word of God being proclaimed. The ambo for this renovated Mormon-meeting-house-turned-Catholic-Church is made of solid quilted cherry. This small, Mexican inspired chapel ambo has brightly painted accents. This Romanesque themed ambo is made of walnut, pinion burl and ebony. 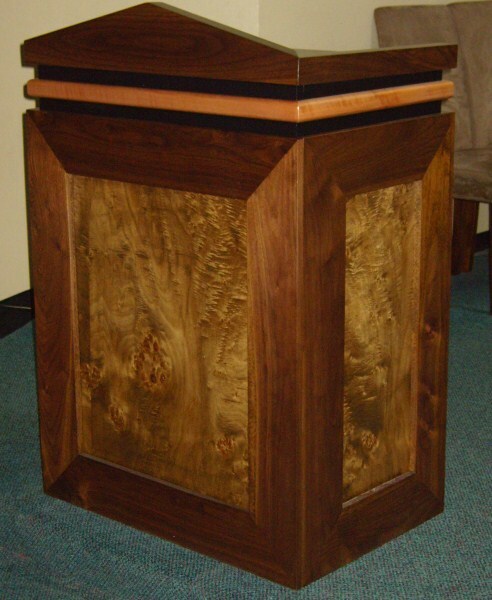 This mahogany and black granite ambo matches the custom altar, especially the hand carved trim below the book rest. 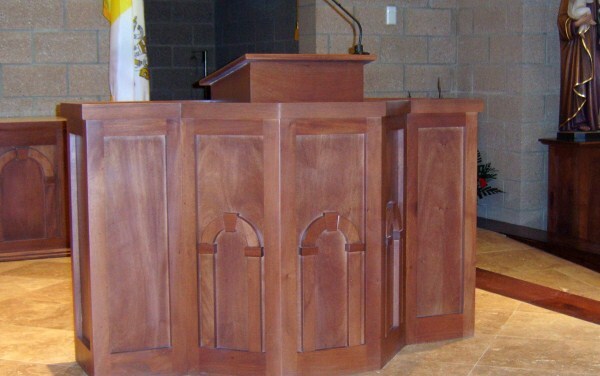 This ambo has many intersecting angled surfaces and inset sweeping arch that matches the sweeping ceiling of the chapel of Holy Spirit Retreat House in Encino, California. The effect of the arched legs of this ambo is to lift the eyes upward towards the word. This ambo features the same red rock found in the surrounding canyons of this little church in Moab, Utah. Ok, so what's the difference between and ambo and a pulpit? An ambo us on the same level as the altar and a pulpit is usually elevated above the chancel. 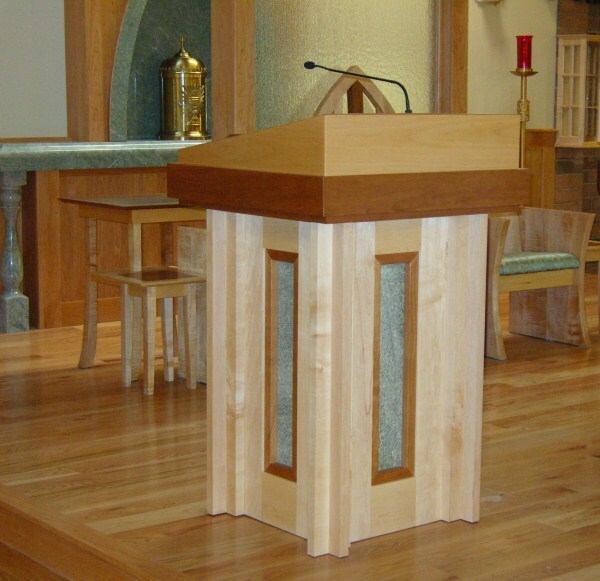 The ambo should complement the altar in design, materials, and color, but it doesn't need to be just a mini altar. The ambo should also be practical. We design our ambos to be usable by a majority of people, with plenty of storage for books, homilies, and papers.